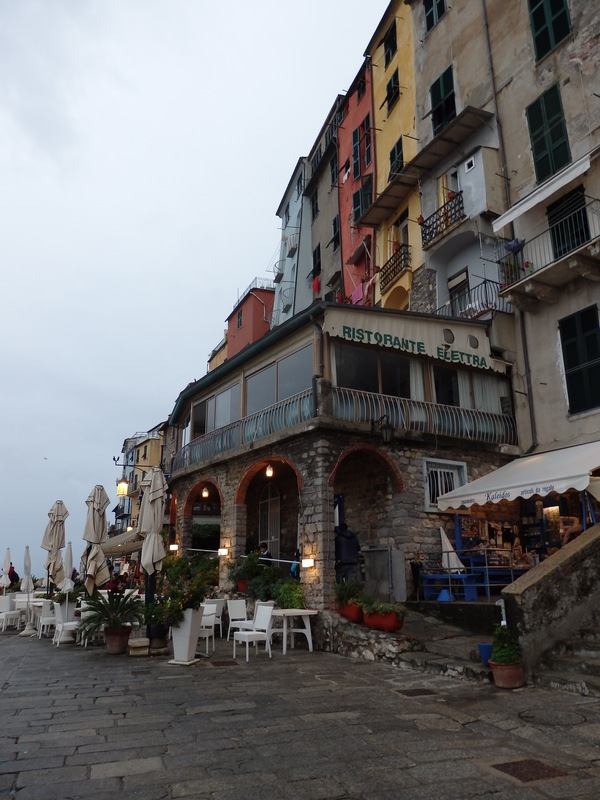 Restorante Elettra in Portovenere– famous for its anchovies w/lemon, stir-fry w/squid, shrimp and fish, and nettle noodles w/seafood. 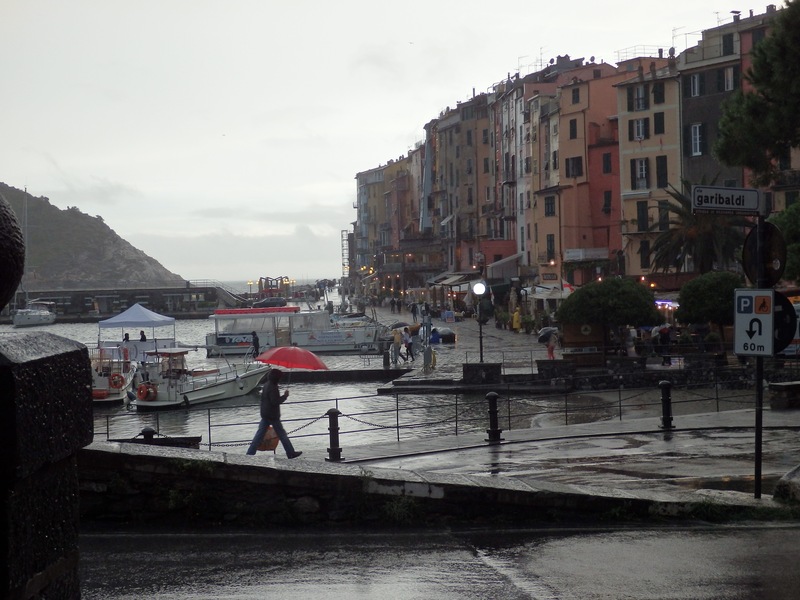 Lovely Portovenere captivates, even on a rainy day. 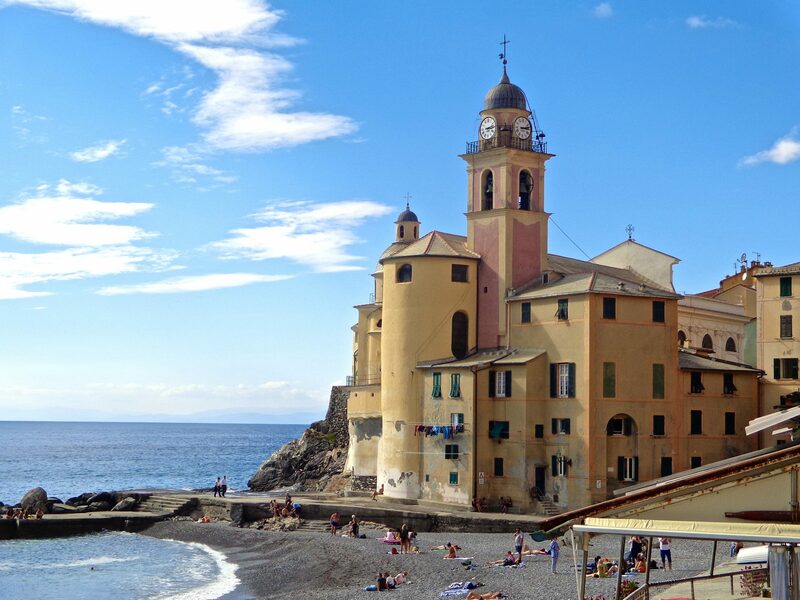 Picturesquely situated on the Riviera of Liguria, this cobbled and quaint little village offers a dose of old Italy in colorful hues. On an early morning exploration of the Italian Riviera just this last September, I left Chiavari and headed south along the coast. 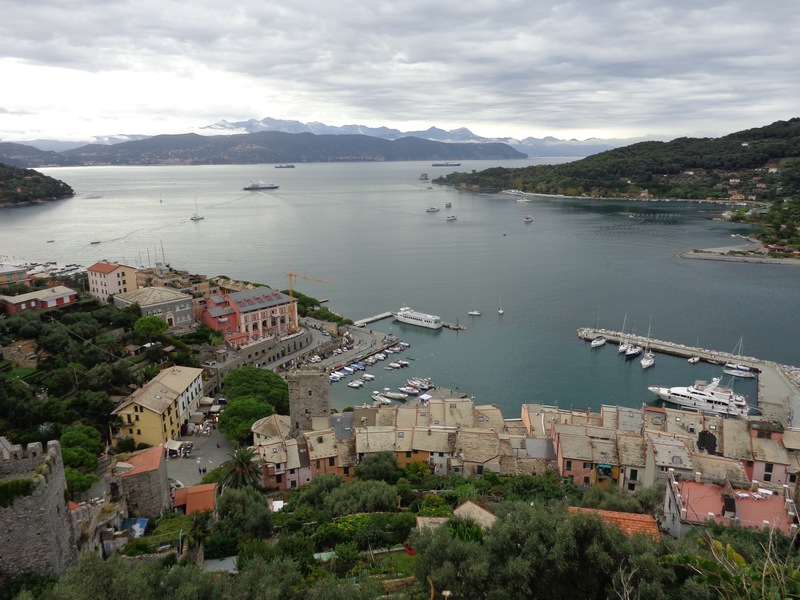 Portovenere was on my radar, and I wasn’t about to let grey billowy rain clouds change my plans. When I did arrive, I was greeted by a thunderous torrent. So much for hospitality! Stunning yacht and streamlined sailboats. 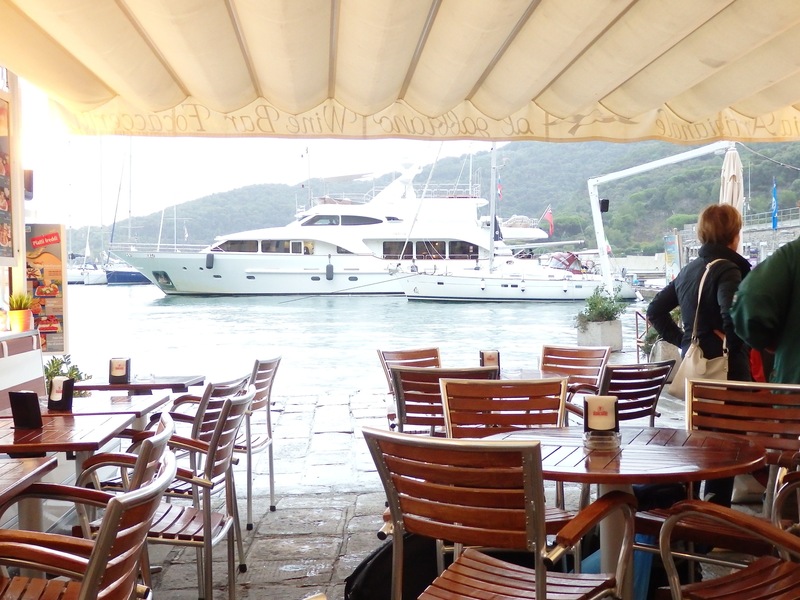 This quay cafe provided a refuge from the downpour and a cup of steaming cappuccino! Fortunately the downpour eased up into a light sprinkle before long. But meanwhile I found refuge under this waterfront cafe. 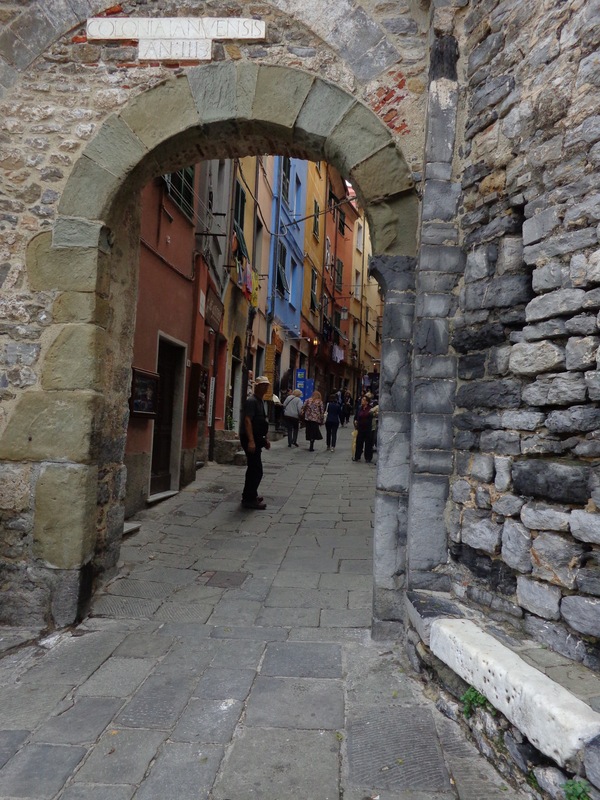 Established since the first century BC, Portovenere was originally named “Portus Veneris,” translated ‘Port of Venus’. A temple of the goddess Venus is thought to have stood on the rugged cliff overlooking the sea where San Pietro church stands today (more of this in my next post), just above the village. In Roman times, Portovenere was a fishing community much like today, except now the harbor is dotted with trendy sailboats and yachts. Piazza outside the entrance to the old village–so inviting! 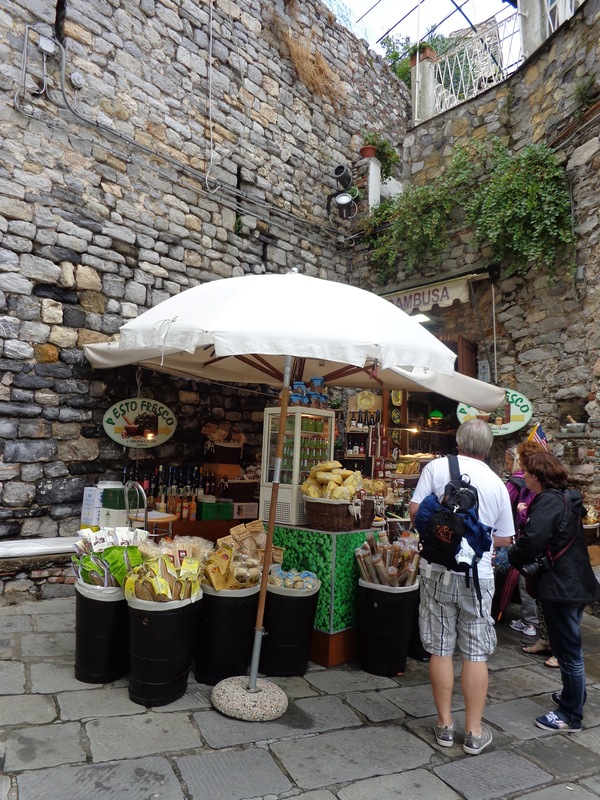 Greeted by tall pastel-colored houses, a medieval tower and castle crenelations, I passed a refreshment stand at the opening of the old town and proceeded through the archway (mid-picture). Umbrella refreshment stand, ready to take on the weather. I loved the rock-work behind it. Entry onto Via Capellini, the old medieval main street lined with shops. Look above the arch and you will notice the prior arch which was higher up. The archway into the village and the surrounding walls were built in the mid 12th century. It has been resized a time or two, making it smaller. Above the arch is an old Latin inscription. An effigy of the “white Madonna,” patron saint of the village, was on the wall. Her feast day is celebrated in August, with hundreds of oil lamps lit at night that float on the water beside a torchlight procession. Wouldn’t that be a beautiful sight? Narrow gray brick streets centuries old dipped and swayed a bit in places. Tiny shops framed the street in tightly, some of their wares spilling out the doors. They were so colorful and intriguing, I must have peaked my head into all of them. 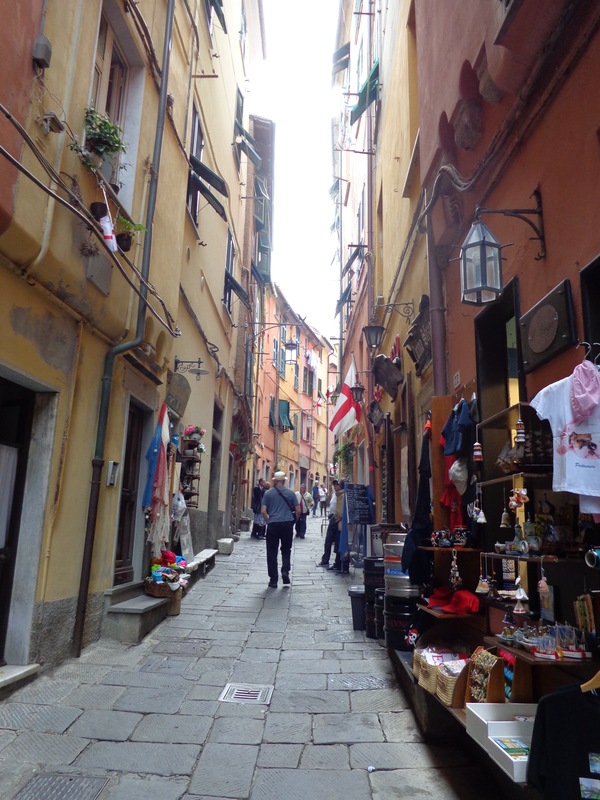 Handmade gifts, olive oil, prosciutto, cheese, clothing, shoes, cafe’s, pizzeria’s, gelato, galleries, local Ligurian ceramics and handiwork….all creatively adorned. The Calata Doria, or the quay, is lined with tall narrow houses six to eight stories high. Built in the middle ages, these buildings served as defensive towers against invading pirates. This position directly above the harbor gave them the advantage of escaping out the back doors and up the hill to the old Genovese castle fortress. Below are stairs I descended to the waterfront. 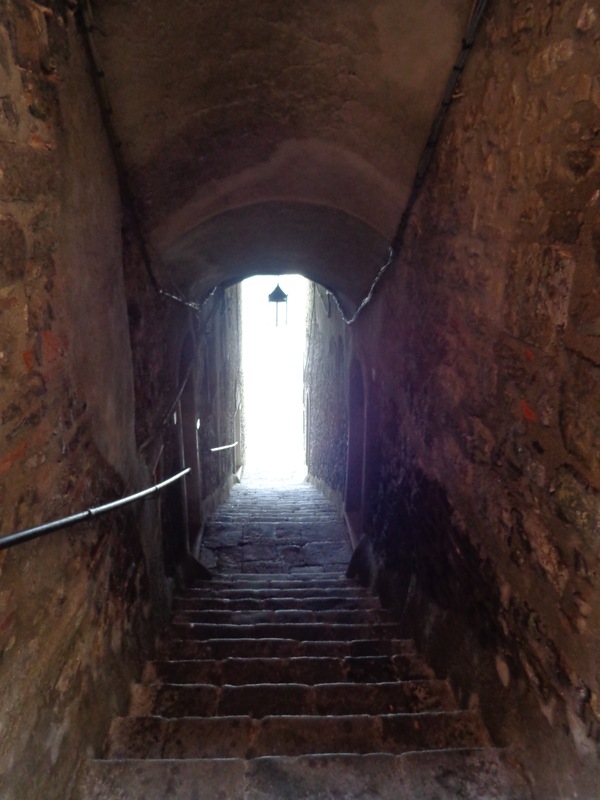 Long, dark and spooky, I can envision marauding pirates rushing up the stairs with knives in their teeth! Stairs leading from the village main street down to the quay. At the end of the street through the village, vaulted walkways and stairs lead up to the most exotic part of town. 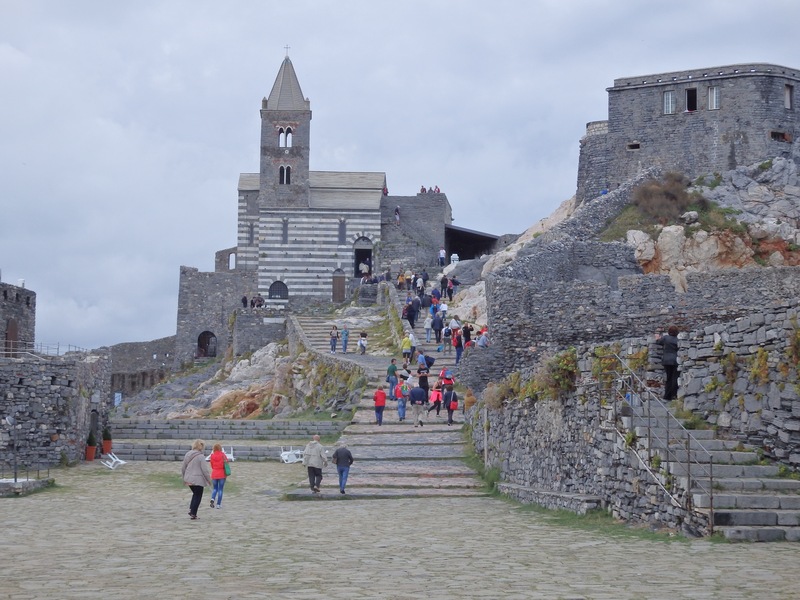 The old church of San Pietro sits perched on a cliff overlooking the sea. Ruins of the well-preserved Genovese castle rise majestically above it. The famous Cove of Poets lies below, the subject of a surprising story. I’m excited to share the illustrious history and unstated charm of these cliffhanger dwellings in my next post. Coming very soon…..Stay tuned….. 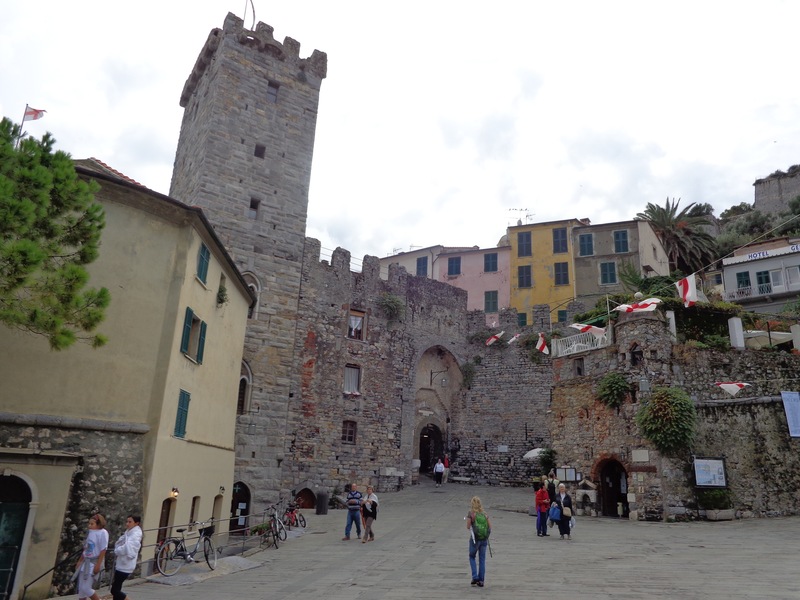 If you have enjoyed this article on Portovenere, please like it and share with others. Better yet, follow me as I continue to reveal my most recent Italy adventures! As usual enjoyed the post and pictures. 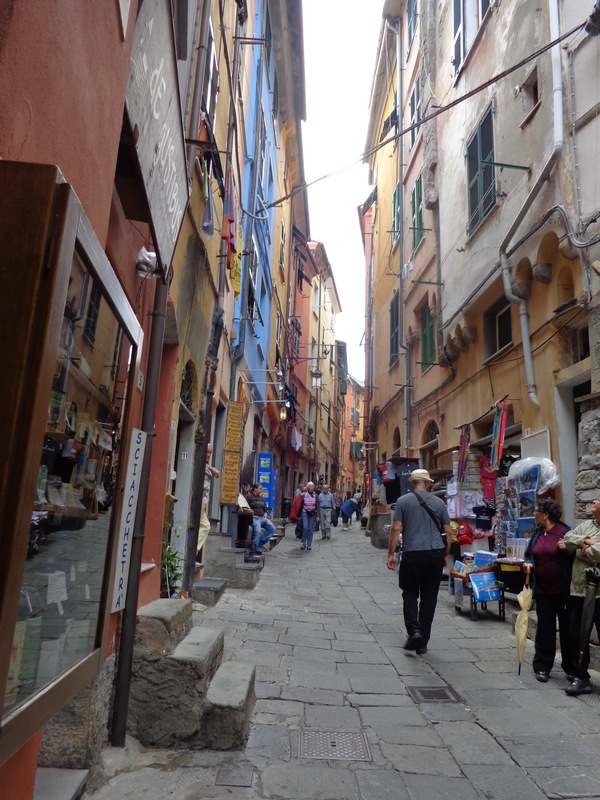 I was in Portovenere toward the end of a week-long cooking, sight seeing (and eating) tour in 2006. I remember that one of my chores was to find a place to empty a memory stick to a disk. Besides that, of course, enjoyed the sights. Your photo that was the “aha moment–I’ve for sure seen and visited that” was the one of San Pietro and the castle. Thanks. Good Morning Joan, always so great to hear from you! 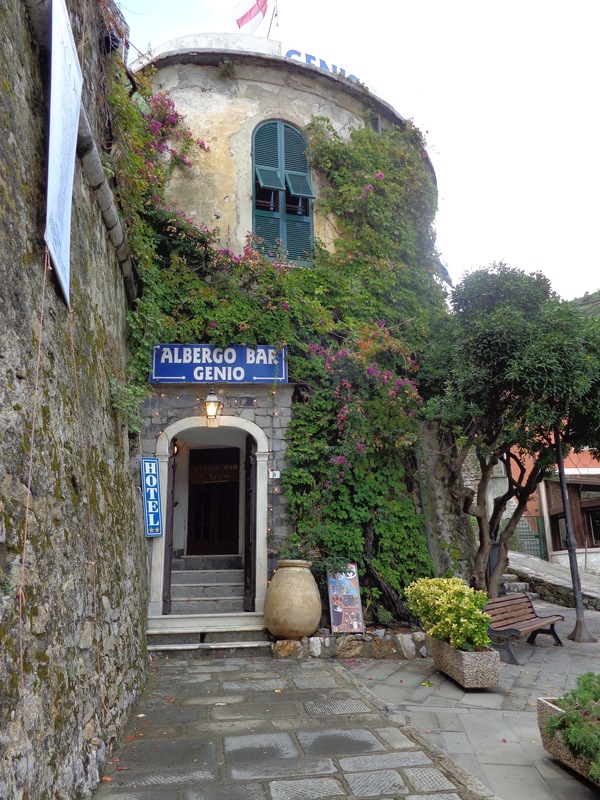 Thank you for sharing your experiences in Portovenere. It really stole my heart. And you are right…the icing on the cake is San Pietro and the Bay of Poets, which I will cover in my next post. It seemed so much I thought 2 articles would be better. Don’t you love that photo of San Pietro? I’ve seen very similar ones, and it look so surreal! Have a great weekend.